The British Prime Minister will address the House of Commons today following a number of meetings in Brussels last week. British Prime Minister Theresa May at a media conference at an EU summit in Brussels last Friday. THERESA MAY WILL warn MPs that a second Brexit referendum would do “irreparable damage” to British politics when she addresses the House of Commons today. “Let us not break faith with the British people by trying to stage another referendum,” she is expected to tell parliament, according to extracts from her speech released by Downing Street. “Anther vote… would do irreparable damage to the integrity of our politics,” she will say, adding that a second vote “would likely leave us no further forward”. She will warn that another referendum would also “further divide our country at the very moment we should be working to unite it”. 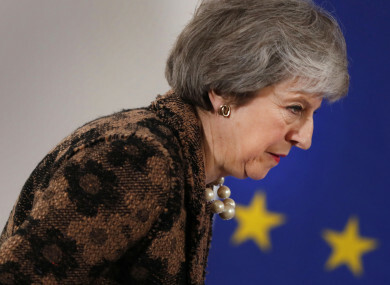 May has long faced calls for a second referendum to resolve the impasse over the terms of the UK’s withdrawal from the European Union. However, the British Prime Minister has argued that this would betray the 2016 result and undermine public confidence in politics. Campaigners for another referendum believe that May’s comments demonstrate that the idea is being taken seriously. Dozens of MPs from the main parties in Westminster also support a second referendum, as do former prime ministers John Major and Tony Blair. There have also been reports that government officials are considering giving the public a vote. Last week, May delayed a crucial vote by MPs on the draft Brexit deal until next month, leaving the political scene in limbo. If parliament fails to approve the text, Britain will crash out of the European Union under a ‘no deal’ scenario – a prospect that experts warn could lead to serious trade disruption and trigger a financial crisis. But former foreign secretary Boris Johnson, a leading Brexit campaigner, said anyone considering a second referendum was “out of their minds”. “A second referendum would provoke instant, deep and ineradicable feelings of betrayal,” he has written in his weekly column in the Daily Telegraph today. Email “Theresa May: second Brexit referendum would do 'irreparable damage' to integrity of British politics”. Feedback on “Theresa May: second Brexit referendum would do 'irreparable damage' to integrity of British politics”.